Porto Moniz is a charming small village perched on the dramatic north western tip of Madeira. The region offers towering mountains and views over endless deep Atlantic Ocean blue. 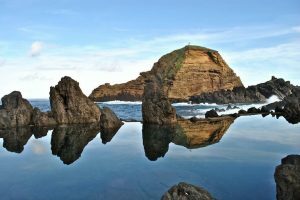 Historically, the topography of the region isolated Porto Moniz from the rest of the island. Yet it survived by specialising in whaling, a practice which continued as late as the 1980s. Along the modern promenade you will find a variety of cafes, touristy restaurants, souvenir shops and the Living Science Centre. It is a place for cultural exhibits and science exploration. The world knows Porto Moniz for a different reason though: its lava pools. 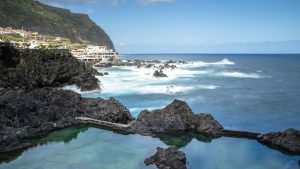 According to The Guardian newspaper, Porto Moniz is one of the top 10 most beautiful seawater swimming pools in Europe. The natural pools of Porto Moniz are one of the most beautiful places to take a dip in the ocean, anywhere. Volcanic lava formed the pools following a 6,000 year old eruption, today they contain only clear sea water. Huge Atlantic waves continuously pound the black basalt lava, which makes for a truly unique swimming pool experience. A dive is fascinating for people of all ages. The seawater lava pools fill naturally at high tide, offering a dramatic setting for swimming or paddling. The pool water heats up naturally by the sun and averages about 20C (winter/summer average). In summary, this is probably the best part of Porto Moniz. If however you are less interested in bathing, and more interested in the birth of Madeira and lava rock formations, we’d recommend a visit to the Sao Vicente caves. 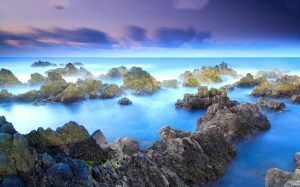 There are two sets of lava pools in Porto Moniz. On the one hand the completely natural pools that overlook the Ilheu Mole island on the other hand the western pools, converted into a dramatic Lido pool. The Lido pools (Piscinas Naturais do Porto Moniz) are a much safer location for swimming, especially when visiting with children. There are no sharp rocks here and there’s lifeguard supervision. The surrounding rocks of the Lido are now a terrace, nice for sunbathing. You can access the Piscinas Naturais for an entrance fee of €1.50. They open every day from 9:00-19:00 (9:00-17:00 during winter). There are changing rooms, showers and good facilities for a relaxing day. Close to the island ‘Ilheu Mole’ you will find more pools unaltered by human intervention, which means they are beautiful but also present dangers. The rocks are sharp, slippery and unforgiving if you trip. We recommend to take pictures at the natural pools and then spend the day at the Natural Pool Complex.One of the attractions of the lava pools is watching big waves rolling in and crashing onto the rocks, sending a salty spray into the air. 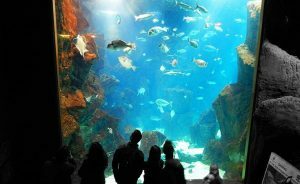 The Porto Moniz aquarium has more than 70 typical species, along with an exhibition, and is housed in an old fortress. The historic Fort of João Batista was built in 1730 to protect the area from pirates raids. An impressively steep mountainous landscape surrounds Porto Moniz. It offers some excellent views of the coast. One of the best viewpoints is the Miradouro da Santa, on the old road (ER101) south from Porto Moniz.